Steve Griffin | The Salt Lake Tribune Mia Love addresses the audience as she debates Doug Owens, in Utah's premier congressional matchup in the 4th district at the Dolores Doré Eccles Broadcast Center on the University of Utah campus in Salt Lake City, Tuesday, October 14, 2014. 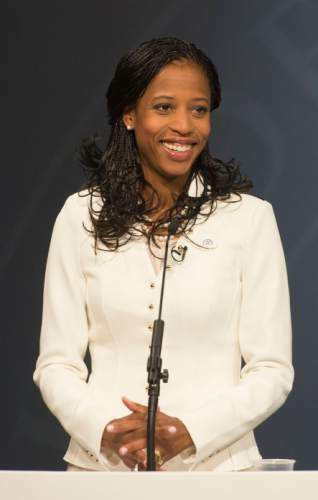 Steve Griffin | The Salt Lake Tribune Mia Love addresses the audience as she debates Doug Owens, in Utah's premier congressional matchup in the 4th district at the Dolores Doré Eccles Broadcast Center on the University of Utah campus in Salt Lake City, Tuesday, October 14, 2014. 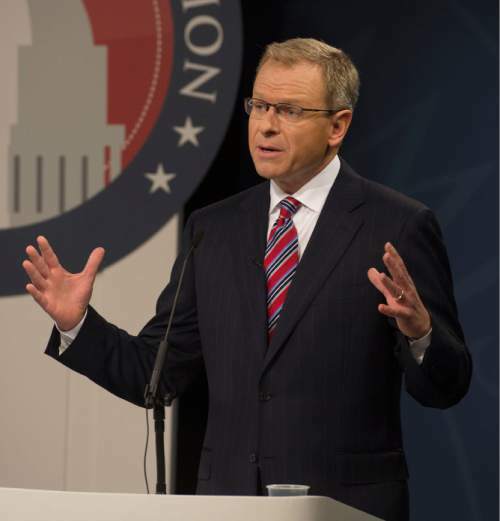 Steve Griffin | The Salt Lake Tribune Doug Owens addresses the audience as he debates Mia Love, in Utah's premier congressional matchup in the 4th district, at the Dolores Doré Eccles Broadcast Center on the University of Utah campus in Salt Lake City, Tuesday, October 14, 2014. 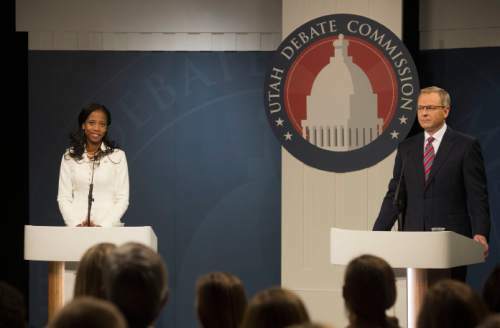 Steve Griffin | The Salt Lake Tribune Mia Love and Doug Owens, running in the 4th District, debate in Utah's premier congressional matchup at the Dolores Doré Eccles Broadcast Center on the University of Utah campus in Salt Lake City, Tuesday, October 14, 2014. Steve Griffin | The Salt Lake Tribune Doug Owens addresses the audience as he debates Mia Love, in Utah's premier congressional matchup in the 4th district, at the Dolores Doré Eccles Broadcast Center on the University of Utah campus in Salt Lake City, Tuesday, October 14, 2014. 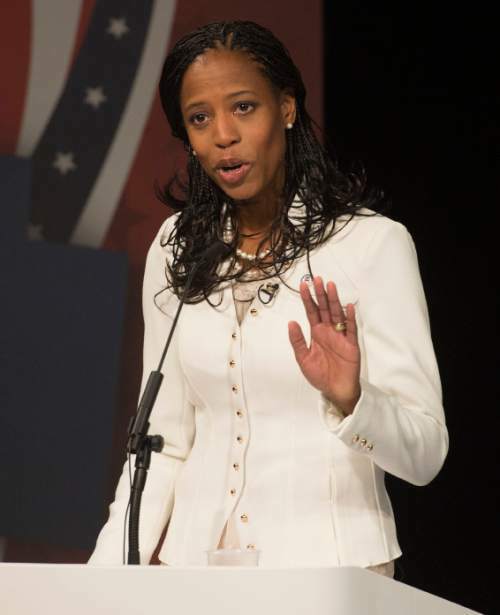 Republican Mia Love has definitively claimed Utah&apos;s fundraising crown and is less than three weeks away from learning if she&apos;ll get the prize she truly seeks: a seat in the U.S. House of Representatives. Love amassed nearly $1.47 million in the past three months, according to new financial reports due late Wednesday. That&apos;s an unheard of amount for a House race in Utah and dwarfs what normally would be considered a respectable quarter from Democratic opponent Doug Owens, who raised $294,700. In reaction, Love, a former Saratoga Springs mayor, emailed comments that appear to be an understatement. "I am confident," she said, "I will have the resources to continue getting our message out, meeting with voters, and listening to their concerns and suggestions on how to make changes in the way our federal government operates." If Love wins in Utah&apos;s 4th District  she is now the front-runner  she would be the first black Republican woman in Congress. While she has downplayed that on the campaign trail, her staff has highlighted her potential historic status in fundraising solicitations sent to supporters throughout the nation. Her campaign is fueled by these small-dollar donors. Contributors who give less than $200 in a campaign cycle are not required to put their name on a disclosure form. Love collected nearly $700,000 in these unitemized donations from July through September. And she raised nearly $600,000 from donors who did kick in more than $200. Almost all of that trackable money came from outside Utah. She raised $84,400 from those with Utah addresses. Two notable in-state contributions came from Jon and Karen Huntsman, the billionaire philanthropists who each gave $2,500. In 2012, the Huntsmans supported Rep. Jim Matheson, D-Utah, who edged Love in her first run for Congress. Owens called Love "a national celebrity" and suggested her focus on out-of-state dollars showed where her attention lies. "It&apos;s clear her method of raising money is appealing to a national partisan ideologically bent person," he said, "and Utah voters ought to be asking if that is what they want." 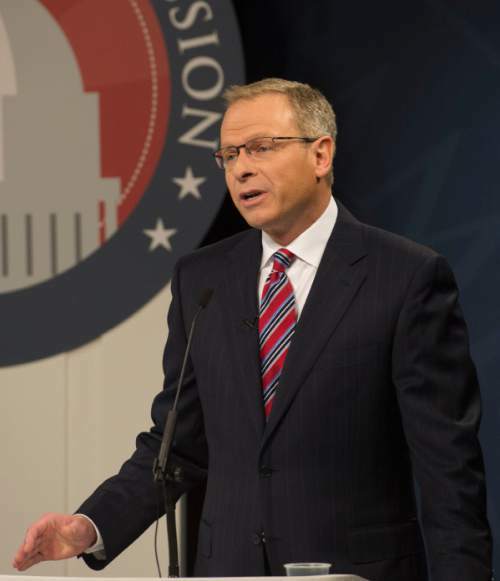 Love&apos;s campaign manager, Dave Hansen, responded by saying that Love&apos;s average Utah donors give far less than Owens&apos; average contributors, whom he described as "the rich and elite." "These are people who are average people out there who believe in her and that&apos;s why they are giving some money," Hansen said, "but they are not writing out checks bigger than a family will spend at Costco in a month." Love&apos;s latest quarterly fundraising is likely a record for a House candidate from Utah. It tops the $1 million she gathered during this same time period in the 2012 race. By contrast, the biggest sum Matheson, who decided against seeking an eighth House term, raised in any period was $471,000. Owens, a corporate defense attorney, knew he&apos;d be at a disadvantage when it came to political cash. He focused his efforts almost exclusively in Utah and took in money from Democratic officeholders, unions, lawyers, university professors and medical practitioners. His wife is a pediatrician. He spent $210,500 on advertising in the past three months, which he has used to introduce himself to voters and criticize Love&apos;s positions on education. Love spent four times that amount on ads and has produced spots with Utah Gov. Gary Herbert defending her on education and former GOP presidential nominee Mitt Romney endorsing her. A recent Utah Policy poll showed Love ahead by 9 percentage points in what is expected to be the state&apos;s tightest congressional race. It is also the only one without an incumbent. The three other House races had nowhere near the level of activity seen in the 4th District, which includes West Jordan and stretches past Nephi. In the 2nd District, which includes Salt Lake City, Democrat Luz Robles, a state senator, raised $16,300 and reported spending nothing on her race against freshman Rep. Chris Stewart, R-Utah. But Robles said Thursday that was an error by the contractor filing her disclosure and she soon would amend it. The candidate said she spent money during the period but personally was unsure of the total. Stewart has $300,000 cash on hand going into the waning days of the campaign; Robles has $36,600. In the 3rd District, which includes Provo, Democrat Brian Wonnacott didn&apos;t file a report and previously has said he has no expectation of beating Rep. Jason Chaffetz, R-Utah. Democrat Donna McAleer has put up more of a fight in the 1st District, which includes Logan and much of northern Utah. She raised more than $94,000, while Rep. Rob Bishop, R-Utah, brought in more than $120,000 in his bid for a seventh term. Their race is a rematch from two years ago, when Bishop won by a 3-to-1 margin.